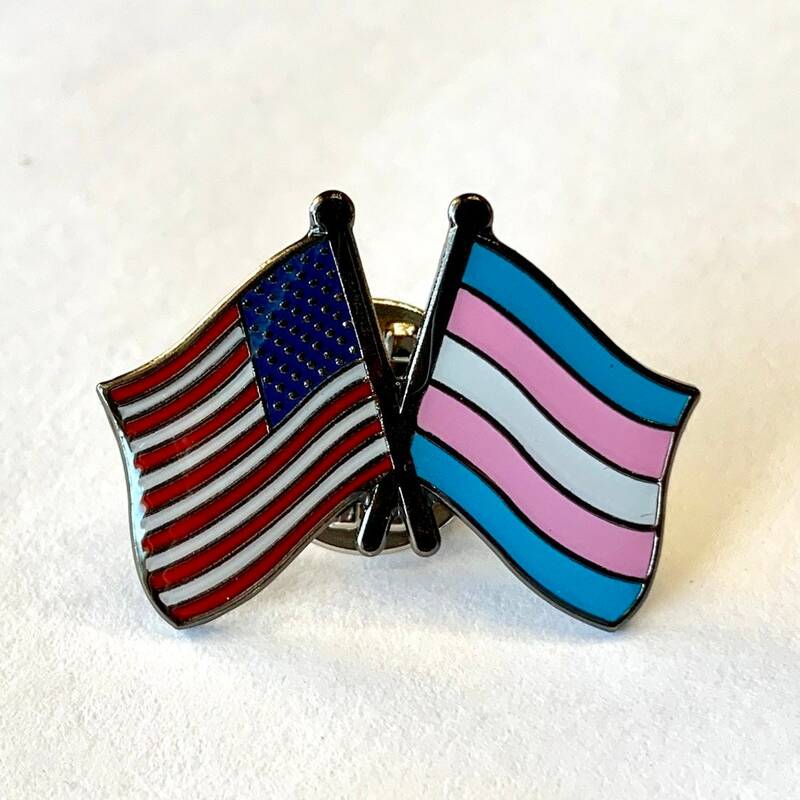 This pin is named for the estimated 13,000 active-duty service members who might lose their commissions, promotions, pensions, careers, or sanity, over a very ignorant and uninformed ban taking effect soon on transgender service members in the United States Armed Forces. #LetUsServe is a reminder that we have what it takes, because we’re already doing it. 20% of proceeds for April (including all backorders) are being made as a personal donation from me to SPART*A, an organization of transgender and allied active service members, veterans, families, and supporters, who are going above and beyond to prove not only the dignity but the distinction of our service members, who are just trying to be their best possible selves as they protect us, save our lives, and advance their own carers through duty and service to others. Learn more at SpartaPride.org! I put these flags together these because sometimes your queer patriot street-cred comes from gender identity and sexual orientation too! Or maybe you're just a huge ally. Well, in this analogy, Transgender is kind of like Puerto Rico. It's definitely a small subset of the United States population, and while it is part of the United States in may respects, it's also it's also actually its own independent country too. It has its own advocacy needs, that are sometimes different than the mainland LGB community. Furthermore, like Puerto Rico, it's not too uncommon to feel like it gets a bit overlooked by the mainland LGB community, almost as if it doesn't exist when it's inconvenient. Like when a big storm comes through, for example. Size: Pin is approximately 25mm (1”) at its widest, and a little over 20mm (3/4”) as tall. The stud and the clasp extend backward approximately 10mm, a little under half an inch.